In part 4 of the How to Evaluate Ingredients series, I’m switching back to poultry. Parts 1 and 2, focused on poultry and how changes in the levels of major nutrient categories such as crude fiber and total fat levels, affected usable or metabolizable (think useful for productive purposes) energy of the complete diet. In part 3, I wrote about by-pass protein in the rumen and small intestine – a ruminant perspective most applicable to dairy. This blog is a little different because I’ll be discussing feed form – specifically, what happens when you use ingredients to construct a complete diet, and then, feed in either a pellet or mash form. First off, let’s define these terms. The image above goes a long way in explaining the differences, but when typical ingredients are mixed into a complete diet and fed, this is mash feed. When the mixed ingredients (mash feed) are run through a pellet mill before feeding, as the names implies, this then allows pellet feeding. So, does the final feeding form need to be considered when evaluating ingredients? We can return to the study used in evaluating ingredient blogs part 1 and 2 for some insight. 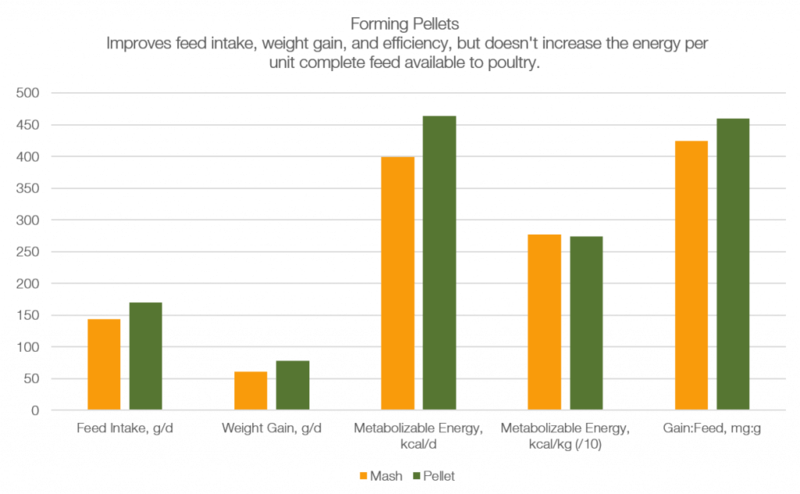 This study generated performance data with broiler chickens fed several formulations that were either pelleted or fed in mash form, and there were clear benefits to pelleting. This is why broiler feeders will often put in massive pellet mills – broilers will consume more feed when pelleted (far left bars); exhibit more weight gain (second from left); and consume more energy per day due to the increased feed intake (middle bars). However, as we’ve pointed out in a previous blog, pellet mills are primarily used to form pellets only. This is confirmed here, as the metabolizable energy content of the ingredients in complete feeds (per unit) is not increased with pelleting (second set of bars from the right). This is why it’s important to use high quality, ingredients that are processed properly in a formulation, including high-shear dry extruded, whole soybeans (extruded “full-fat”) and ExPress® soy meal. Pellet mills are not meant to cook ingredients. It’s worth pointing out that, for some of the diets used in this study, pelleting did have a minor benefit on feed efficiency (my calculation, shown on the far right bars, weight gain relative to feed intake). However, the benefit was very minor (+35 mg weight gain, or 0.035 g, per g feed intake) and was likely only specific to a few ingredients found in certain formulations. While the cause of any of these benefits is unknown, as discussed, we already know that it was not due to increases in metabolizable energy per unit complete feed – with energy being the most expensive portion of a broiler diet (in absolute terms). Finally, pelleting often requires the use of certain ingredients at certain levels to improve pellet quality, like 10% wheat diets, rice bran, or even pellet binder ingredients. This will place limits on the use of other ingredients that you may want in the formulation. If you are interested in learning more, check out parts 1, 2 and 3 of this blog or send us a message.